How Would You Like Your Sandwich? ME: I’ll have a plain cheeseburger, please. WAITRESS: Would you like ground beef, turkey burger or veggie burger? ME: Uhhh, just a cheeseburger so I guess ground beef. WAITRESS: How would you like that cooked? Rare, medium, medium well, or well done? WAITRESS: Would you like American, Provolone, Colby Jack, Mozzarella or Pepper Jack Cheese? ME OUT LOUD TO WAITRESS: American cheese, please. WAITRESS: Would you like that on white bread, wheat bread, rye bread, a hamburger bun with no seeds, a hamburger bun with seeds, a spinach wrap, tomato basil wrap or a croissant. ME WITH EYES GLAZED OVER; A white plain ole hamburger bun. WAITRESS: Would you like lettuce, tomato, ketchup, mustard or mayo on the side? ME WITH MOUTH WIDE OPEN: No, thank you. Just a plain cheeseburger. WOW!!! What happened to the simple “I will have a plain cheeseburger, please” order? It was so simple but now even ordering a cheeseburger is complicated! OK, I may have exaggerated the above scenario for emphasis but you know what I’m talking about. This is how the devil does with the gospel of Christ. It’s very simple but he wants to dangle all of these other choices in our face to get us confused and distracted from Christ. Don’t let all of the choices of the world get you off track. It’s as simple as Paul says in Acts 16;31, “Believe in the Lord Jesus Christ and you will be saved.” No gimmicks. Jesus loves you just as you are and wants you to live for Him and with Him eating at His table in heaven for eternity………plain ole cheeseburger and all! 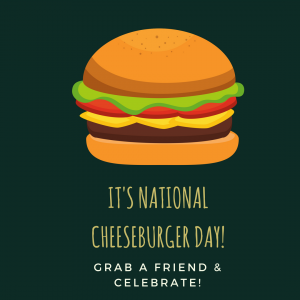 This entry was posted on September 18, 2017 with tags: #nationalcheeseburgerday by Deanna Young.